2 Where Do Carolina Wrens Live? 4 What Do Carolina Wrens Eat? During the summer in the Eastern U.S., the Carolina wren can be heard just about anywhere. It’s a cinnamon colored bird, with a distinctive white eyebrow stripe, white throat and underbelly, and a stout, upward facing tail. This plumage gives the Carolina wren perfect camouflage, but its characteristic and constant teakettle-teakettle call makes it easy to locate. The Carolina wren is a shy bird, weighing just under an ounce. Although large and stocky compared to most wrens, it is still relatively small. Their heads are very large with almost no neck, and the beak is down curved – a distinctive characteristic of most wrens. Although well camouflaged, they tend to be brighter in color than other wrens. The males and females have almost identical plumage, though the males tend to be a little larger, with longer bills, wings, and legs. Where Do Carolina Wrens Live? The Carolina wren – the state bird of South Carolina – is found mainly in the U.S. and Central America, with the most abundant populations in the southern U.S. The population in Mexico tends to have more brown plumage and more distinct markings than the U.S. population. Although sensitive to harsh winters, this wren has been moving its territory slowly north for the last hundred years and scientists speculate that climate change and warmer winters are partially to blame, as well as reforestation, forest fragmentation, and an abundance of bird feeders. While northern populations often decline after extremely cold winters, they tend to rebound within a few years. These small, chunky birds can be difficult to spot, as they blend in well with their surroundings. They prefer dense forest understories, thick with brush and vines and are especially partial to ravines, cypress swamps, and any lowland wooded area choked with rhododendron and hemlock. However, they are also common backyard birds and have been known to nest in yards, garages, and woodpiles, but prefer artificial spaces that are wooded, shrubby, overgrown, or dilapidating. What Do Carolina Wrens Eat? The Carolina wren is generally a hardy bird that feeds mainly on insects and spiders. When searching for food, they will turn their tails up and when singing they will pop them back down. They have similar movements to creepers and nuthatches but mostly forage for insects on the ground. While caterpillars, moths, stick bugs, leafhoppers, beetles, grasshoppers, crickets, spiders, snails, and cockroaches make up the majority of the Carolina wren diet, they have also been known to consume lizards, frogs, and snakes. They also eat some fruit and seeds and are one of many bird species that feast on poison ivy. It is often said that Carolina wrens are heard and not seen. 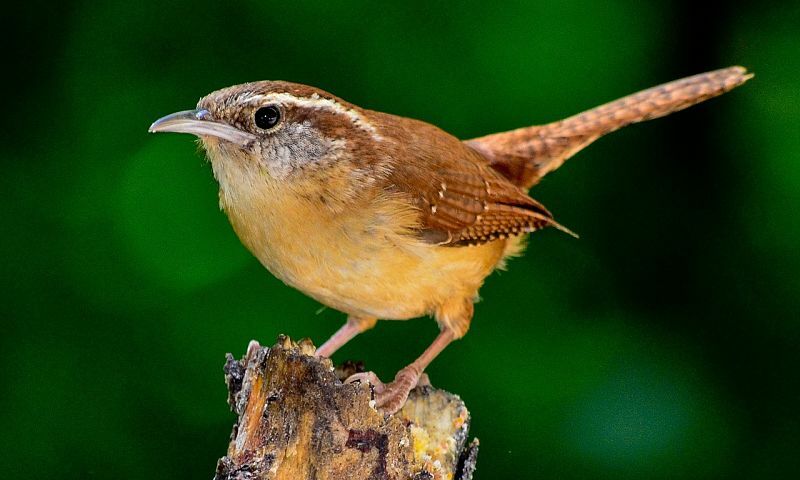 One captive Carolina wren was recorded singing almost 3,000 times in one day. Their song is loud and variable and pairs will often sing together. The males will sing while the females chatter in the background. You can listen to a recording of the Carolina wren song here. A pair of Carolina wrens can bond at any time of the year and will usually stay together for life. The pair will develop a territory that they defend aggressively by singing and chasing off intruders. They will stay in this territory year-round and forage for food within its boundaries. Carolina wren pairs tend to nest about one to two meters off of the ground in natural open cavities or in artificial, covered vessels. Wrens have been known to make nests in flowerpots, mailboxes, propane tank covers, boots, and even coat pockets. Both males and females assist in nest building, although one will stay at the nest site while the other looks for material. The male will often put together multiple nests before the pair finally decides on one. The males will also help in raising the young birds. Typically the nests are loosely woven and domed, with an entrance on one side. They range from three to nine inches long and three to six inches wide and take the wrens around a week to build in the early season, and only about four days later in the season. The nests are made of many different components such as bark, grass, moss, twigs, dead leaves, hair, feathers, straw, and anything else they can get ahold of. Interestingly, a piece of snakeskin is often added to the nest. The females tend to collect most of the inner lining of the nest and even contribute more to the lining during incubation. The pair will often have two broods throughout the season consisting of four to five eggs per brood. In the south, some pairs will have up to three broods. Only the female incubates the eggs, and 12 to 16 days pass before the eggs hatch. During this time, the male will often bring the female food. The young birds leave the nest around 14 to 16 days after hatching but may stick close to the parents for most of the season to feed together. The Carolina wren is not considered an at risk species and their numbers have increased over the last 50 years. It is estimated that they have a global breeding population around 14 million, with 89 percent living in the U.S. and 10 percent living in Mexico. However, subspecies classification of the Carolina wren is still unclear and little is known about their territorial systems and monogamous mating system. 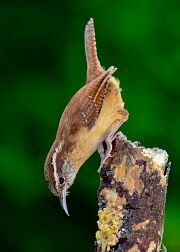 Hey Buddy!, I found this information for you: "The Carolina Wren Bird". Here is the website link: http://backyardbirdingblog.com/carolina-wren/. Thank you.